Last year was marked by some negative events about Facebook – the Cambridge Analytica scandal, then later another breach of personal information. Despite all the negativity, their annual revenue from ads grew and the predictions are for a continuous growth later on. What are the trends for the platform for next year? Facebook watch is an area for user-generated video content. Reports show that video traffic will be increasing and increasing in the following years to reach a level of 85% in 2022. The increase of video consumption over the last couple of years is astounding. The move to more video content seems logical, but so far it has been a mixed success. On one side of course, there is strong competition from channels like YouTube, which were created with the purpose of video sharing. On the other hand there is increased amount of subscription type of video platforms like Netflix, Amazon video and even traditional TV provides moving towards on-demand online service. Overall Facebook Watch is in its infancy and it looks like a long way to go to the level of sticky addictiveness other platforms have. First of all you see videos uploaded by pages you have liked before….which gets you thinking why on the first pace you liked these pages. Comparing to YouTube where you subscribe to channels intentionally and content suggestions seem very relevant, on Facebook Watch you see a random mess of videos. The experience is not great you can easily come upon some religious propaganda within two clicks. Facebook stories are the equivalent of Instagram stories, which are an equivalent of Snapchat. To make it even more confusing Facebook stories are also translated into Messenger, so whenever you react to a story, the creator gets a message from you. Advertising within stories is now quite common with mini skippable video ad formats. The Facebook version is the least successful one. The evolution of stories comes from the change towards mobile devices. With much wider internet access, superior screens and cameras and cheaper costs smartphone use has changed the way social networking works. A well curated social media post has changed into a posting a quick “snap” which has no deep meaning and will disappear in 24 h anyway. Despite Facebook Stories not getting that much views and engagement, compared to Instagram and Snapchat, they still have not given up from them. The way to sustaining future for the platform is through cracking the code of stories and we will see them becoming a very important part of social media. The feed is where still the majority of attention and advertising money is coming in. There increasing concerns with the quality of posts shared and the quick spread of fake news, propaganda and negativity. With all these concerns, it is expected ad revenue to continue growing over the next year. Online advertising budgets have been split between Google and Facebook for the last couple of years. 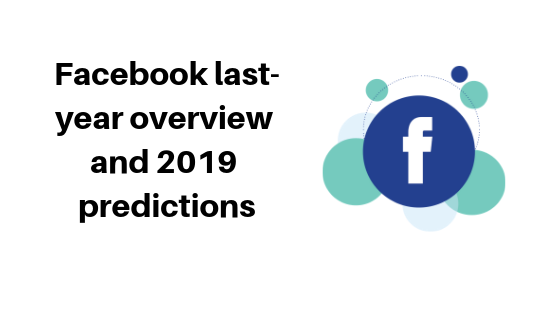 With all the turmoil of 2018, Facebook still grew by 36%, but it is expected to slow down in the following year due to market saturation. What is expected when it comes to ads? New ad formats follow the development of new parts of Facebook. Now you can run ads simoultaneusly on Facebook and instagram stories, but they will not appear in Messenger or WhatsApp(which is also owned by Facebook). The format is either a 15 sec video, single image, canvas or a slideshow of images(carousel). They come with creative stickers and ready made call to action buttons. You can either run the on Facebook Feed and stories or Facebook and Instagram Stories. Video advertising is bringing new opportunities for audience creation. On YouTube you can create audience out of the users who watched your video. You can do the same thing on Facebook or Instagram, simply remarketing people who have watched your video with other ad formats. For example, if you have a successful video you can retarget the people who watched it with ads on Facebook feed, Instagram and Stories on both platforms. You can combine videos from Instagram and Facebook to make the audience larger. If the audience is big enough you can create a lookalike out of it, too. What else is new on audiences? Remember the time I wrote how with Facebook you can target people by their household income? It was one of my first articles ad I was astonished from where they have this information. The answer was partner categories – Oracle, Axiom, Experian. This targeting is no longer available since March last year. Facebook removed the audiences in attempt to improve privacy on Facebook. In the meantime, Google developed some new audiences like Customer Patterns, Life Events, Custom Intent, etc. which target people likely to have some shopping behaviour or are in a certain stage of their life. All of these are made with first party Google data gathered across the seven main platforms Google owns. And since audiences and video have been such a big focus in digital marketing in 2018 and seem to continue in 2019, you can check my book How to Advertise Like a Social Media Agency which teaches you about video ads, Facebook and audiences in much more detail, I could ever go in my articles. It is now available on Amazon, printed and in Kindle format. This entry was posted in Display, Marketing Strategy, PPC and tagged Facebook, instagram, social media, youtube.